The day was sunny and warm and music flowed from every venue in St Paul’s Lowertown. I had the privilege of hosting a number of St. Paul Classical Music Crawl tours this past Saturday, Oct. 10. What a great group of people and what a great collection of musicians. We heard a string quartet from the Saint Paul Chamber Orchestra (at Union Depot), the excellent singers from Glorious Revolution Baroque (at the Baroque Room), student music from the Chamber Music Society of Minnesota School (at Black Dog Café), and members of the Minnesota Opera (at Nautilus Music Theater) all in the course of two hours. In the photos below (taken in the various venues our tour group visited), we’re all smiles because the day was just that good! Just this past Thursday, it was announced that the Minnesota Orchestra will travel to Cuba in May to perform two concerts at the Teatro Nacional in Havana, as part of the International Cubadisco Festival. When it was known as the Minneapolis Symphony, the orchestra performed in Cuba in 1929 and 1930, selling out both shows. When it returns in May of this year, the Minnesota Orchestra will be the first U.S. orchestra to perform in Cuba since the thaw in diplomatic relations began in December 2014. Did you know that listening to music is good exercise for your brain? When we listen to music, our brain works very quickly to interpret musical elements like rhythm and melody. And when we play an instrument, we actually get a full-body brain workout. All of our senses as well as our motor skills are engaged. Classical MPR’s Daniel Nass has shared a wonderful, four-minute, animated video from TEDEd that illustrates just how good playing an instrument is for our brains. It’s not “scary” in the sense that young children can’t attend, but it stir a bit of trepidation for the performers  as happens whenever pieces of new music are played for the first time. 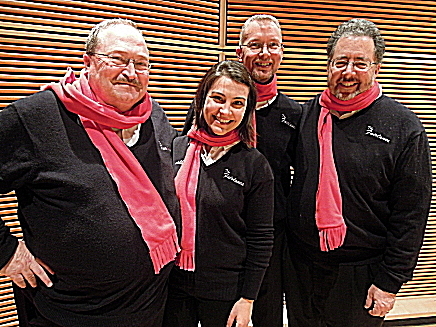 That’s what will happen this Sunday, Feb. 15, at Sundin Music Hall at Hamline University when the Minneapolis Guitar Quartet will perform three new works by Minnesota composers. My colleague Alison Young welcomed the quartet on Friday, and they chatted about the upcoming concert and even performed a couple of selections as a preview. 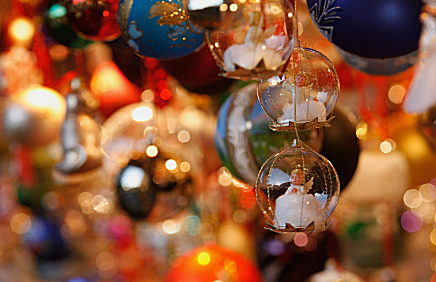 As you’re browsing the Internet this weekend, here are three items you won’t want to miss. Cellist and author Edward Kelsey Moore continues to share his great stories with us. This past week, Edward shared two very personal stories about why Bach’s Cello Suite No. 3 in C Major is my favorite of the six Bach suites. As is typical of his writing, Edward tells these moving stories with humor and heart. Take a few moments to read Edward’s story; you won’t be disappointed. Dr. Justin Henry Rubin is a professor in the music department at the University of Minnesota-Duluth. We were delighted this week to share a premiere performance of Rubin’s Concierto Pequeño, played by the Minnesota Sinfonia, on our Regional Spotlight. Visit the feature to hear this beguiling, six-minute piece. For the second time in the program’s recent history, A Prairie Home Companion will be hosted by someone other than Garrison Keillor. Chris Thile, a mandolin player who has played with the likes of Yo-Yo Ma as well as with his own bands Nickel Creek and Punch Brothers, is stepping in to host Prairie Home this weekend and next. My MPR colleague Steve Seel sat down with Thile to talk about filling those big, red shoes, and Thile describes it as a great honor. Listen to Thile’s interview to get to know him a bit better before Saturday’s 5 p.m. broadcast of A Prairie Home Companion on Classical MPR. This week, Classical MPR unveiled its brand-new website. Make sure to take a tour  and to help you kick the tires on our new site, here are three feature recommendations for you. Learning a new website is a bit like arriving in a city you’ve never visited before: It’s important to learn your way around. After Classical MPR launched its new site on Wednesday afternoon, Managing Digital Producer Brett Baldwin put together this guide to navigating the new site. All the features you enjoyed before, like audio streaming and playlists, are still on the site  they’re just in different spots now! Perhaps it’s like rolling out a new website, perhaps not … but how does it feel for a composer to hear a piece of music performed publicly for the first time? Daniel Nass, who’s a digital producer at Classical MPR, is also a composer. He recently premiered a piece in New York  an original composition for flute, alto flute and cello. As the ensemble performed the work, Dan explains his feelings, which are always a combination of fear, anxiety and exhilaration. Another Dan, MPR News reporter Dan Olson, recently visited Duluth, Minn., where he stopped into the workshop of harp builder David Kortier. A former orchestral musician (bassoonist), Kortier has been building Irish harps since the 1980s. Kortier’s approach to instrument building combines tradition, woodworking skills and musicianship. It’s a fascinating story, and Dan Olson’s photos are really captivating. It just may make you want to learn to play the harp  or learn to build them (Kortier might just want an apprentice). As you’re browsing the Internet this weekend, here are some stories I think you’ll enjoy reading. Many people who enjoy listening to classical music report that it helps them relax or that it helps them to energize. It turns out dogs respond to music much the same way humans do. 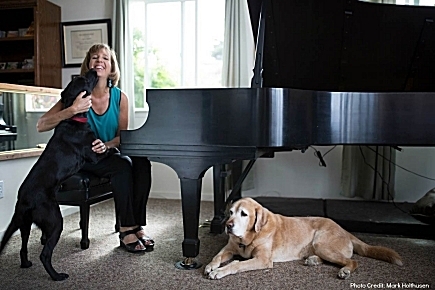 Heather McElhatton, the producer of a new American Public Media program called A Beautiful World, spoke to composer and dog lover Lisa Spector, who has worked on a series of recordings that can help dogs  and the people who love them  to relax and to feel less anxiety. 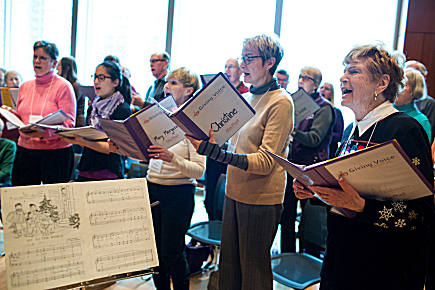 This weekend, One Voice Mixed Chorus  the Twin Cities premier LGBT choir  presents two concerts at the Hopkins High School auditorium. Titled, “Eat, Drink and Be Married,” the concerts celebrate the advances in equal rights for the LGBT community. Earlier today, my colleague Alison Young spoke with OVMC’s Sarah Ramseyer Miller and Allan Warrior about the concerts. We’ve also posted a video that takes you behind the scenes of the choir’s rehearsal for the show. Minnesota Varsity made an important step forward this week, announcing the Featured Round artists in the statewide showcase of teenage classical musicians. Instrumentalists, vocalists, ensembles and composers from up and down the state have been named to Minnesota Varsity’s Featured Round, putting them one step closer to the showcase concert at the Fitzgerald Theater on April 19. BONUS: If Mother Nature cooperates, it’ll be a great weekend to get outdoors to play or to spectate at the U.S. Pond Hockey Championships on Lake Nokomis in Minneapolis. Teams come from across the nation to compete for the Golden Shovel. MPR News’ Jeffrey Thompson has assembled a series of short videos that take us behind the scenes of this tournament that is characteristically Minnesotan. As you’re settling in during this chilly weekend, here are some features to browse on our website as you listen to classical music. 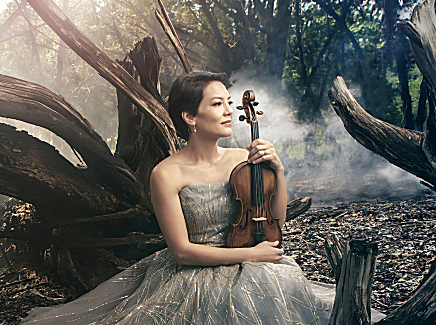 Violinist Anne Akiko Meyers’s album, The American Masters, is featured on this week’s New Classical Tracks (incidentally, you can enter for a chance to win a copy of the CD). One of the pieces on the album is called “Lullaby for Natalie,” a beautiful composition written specially for Anne’s daughter, Natalie, by composer John Corigliano. Anne performs the work on the album, but she also reached out to filmmakers, asking them to create a video for the music. The winning entry is by Timo Henson  take a moment to watch Henson’s fairy-tale video as Anne plays Corigliano’s beautiful lullaby. For bigger kids, we have Minnesota Varsity, the statewide showcase of teen classical musicians, vocalists and composers. All the submissions are in, and they are now indexed at our site. You can listen to each participant’s recorded submission and learn a little bit about him or her. There’s even an interactive map that indicates the towns where the students live. You’ll be impressed by these young talents! Meanwhile, for professional musicians, there’s been an important development for those who fly with their musical instruments. Last week, we discussed the new U.S. Department of Transportation’s ruling that standardizes rules for musicians traveling with instruments. This week, we get insights and reactions from three musicians: violist Sam Bergman, cellist Ed Moore and bassist Ranaan Meyer. See what they have to say about the new rules that go into effect in February. As you’re browing the Web this weekend, here are some things for you to explore. 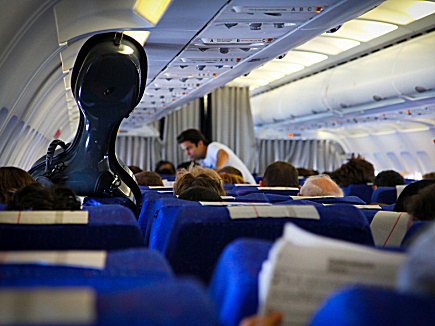 Musicians have encountered uneven experiences while flying with their instruments: some have had no difficulty at all, while others have been bumped from flights or asked to check expensive and delicate instruments as cargo. The U.S. Department of Transportation issued a ruling this week that clarifies the rules for musicians who fly with instruments, in hopes of making the experience consistent across the industry. Between the music on Classical MPR, we often say, “You can find us on Facebook and Twitter.” What does that mean? It’s a great way for you to stay up to date on our on-air programs, live events and online features at Classical MPR. You can follow us in one of two ways  or both!  by liking our Facebook page or by following us on Twitter. Whether or not you’re into social media, a lot of people enjoy receiving the Classical Post, the weekly email from Classical MPR. Each week, you’ll receive programming highlights, concert information and a rundown of recent articles and features. It’s also a great way to find out if there’s a New Classical Tracks CD giveaway, so you never miss the opportunity to enter for a chance to expand your CD collection. You can use this form to subscribe … oh, and it’s free!